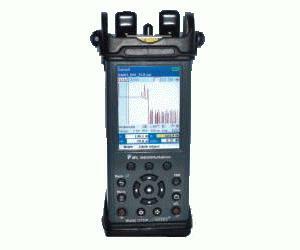 The Noyes M200 from AFL Telecommunications offers unmatched OTDR capabilities in a handheld package weighing less than 1 kg (2 lb). Multimode, Single-mode, and ‘Quad’ wavelength models are offered. With short dead zone and intermediate range specifications, the M200 is ideal for Tier 2 testing of premises (building and campus) networks or certification and troubleshooting of FTTX PON networks. And its bright, transflective display makes it suitable for both indoor and outdoor operation. The M200 is based on a new hardware/software platform that supports automatic and manual setup, precision event analysis, dual-wavelength testing, fiber identification using Noyes ‘TR’ test receivers, rich file naming and folder setup, 6 hour battery life, internal and removable media data storage, and USB connectivity. Test ports are equipped with tool-free adapters, which can be changed in seconds. A custom-designed polycarbonate case and shock-absorbing boot make it our most rugged OTDR ever. Results are saved as industry standard .SOR files, which can be viewed, printed, and analyzed on a PC using Trace600 software (download link on right). Unit firmware, user settings, and test results are saved in non-volatile memory. Thus the M200 may be stored with battery removed for an extended period of time and still be up and running in seconds when needed.